One of the best things about Santa Fe, New Mexico, is the immersive experience in the culture. Everywhere you look, you can see the history of the area. Adobe walls, colorful hanging chiles, and vibrant tapestries can be seen as you walk the streets. If you’d like to delve into the history and culture, we recommend visiting El Rancho de las Golondrinas. As the Southwest’s premier living history museum, it’s the perfect place to go learn a little something during your stay at El Farolito. Do you want to know about more spots like El Rancho de las Golondrinas? Our complimentary Vacation Guide can help! We know that planning a trip can be challenging, so we created this free guide to save you from hours of research. In it, you’ll find outdoor activities, museums, the best Santa Fe restaurants, and more! Cut your planning time in half when you get our free guide today. What Is El Rancho de las Golondrinas? El Rancho de las Golondrinas, translated as The Ranch of the Swallows, was once a historic ranch. Now, it has been turned into a living museum! You’ll feel like you have taken a step back into the 1700s when you explore the 200 acres of rural farm land. See on-site demonstrations, original architecture, period clothing, and more. El Rancho de las Golondrinas revolves around the heritage and culture of 18th and 19th century New Mexico. Buildings on the property date all the way back to the early 1700s! Other historic buildings from northern New Mexico have also been reconstructed here. Period villagers clothed in garments of the time reveal an insight into frontier life in early New Mexico. You’ll have the opportunity to see the past arts and culture through music, dance, and many other aspects of the Spanish, Mexican, and Territorial periods of the Southwest. One of the most special parts about El Rancho de las Golondrinas is the demonstrations done right before your eyes. Every Friday, new and experienced weavers join together to brush up on their skills and learn techniques. Each piece is woven in New Mexican traditional style. Visitors are even welcome to join in and learn local crafts such as colcha embroidery, washing wool with yucca root, carding, spinning on wheels, and dyeing with vegetable dyes. You can choose to embark on either a self-guided tour or guided tour at El Rancho de las Golondrinas. For the self-guided tour, all you have to do it download the free booklet. If you would prefer the guided option, you must make a reservation in advance. After touring and exploring El Rancho de las Golondrinas, make sure to visit the Museum Shop for a souvenir to remember your trip by or a gift for a loved one back home. Don’t be fooled into thinking it’s like your typical gift shop; it hosts a collection of artwork and crafts in early New Mexico traditions. Devotional art such as retablos and bultos is available, as well as tin work, pottery, jewelry, ironwork, textiles, and more in traditional Spanish Colonial style. 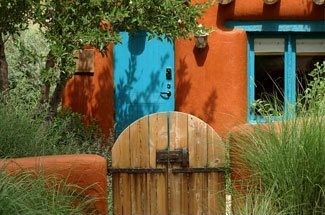 When you’re in a place as culturally intriguing as Santa Fe, don’t settle for a stereotypical hotel. 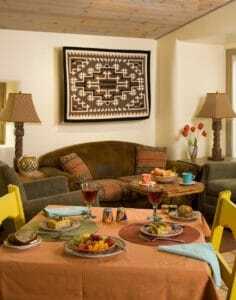 Get a local yet luxurious feel when you stay at Four Kachinas! 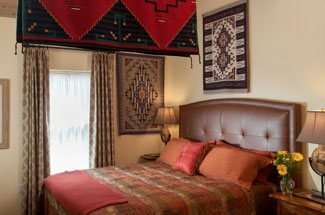 Each of our rooms feature Southwestern decor as well as different themes. Browse our guest rooms, pick your favorite, then book your stay! Plus, we are located in the heart of the city, so you’ll be close to all the attractions like El Rancho de las Golondrinas. We look forward to seeing you!